Adam Cameron's Dev Blog: ColdFusion 2016 in 2016? ColdFusion 2016+1 in 2018? 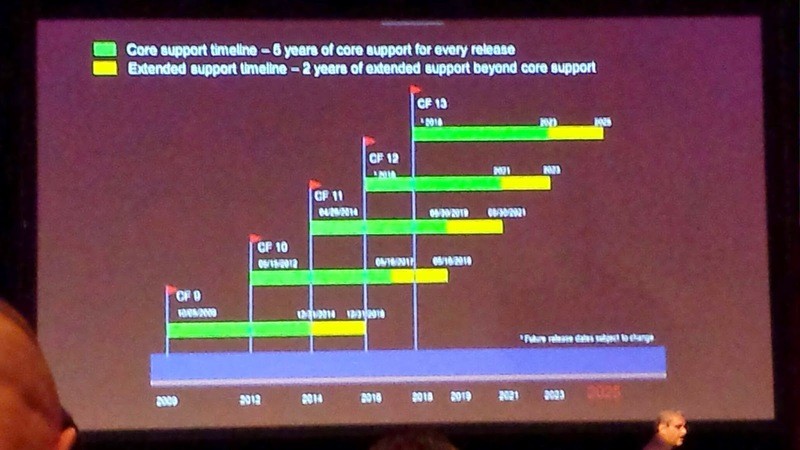 Of course this means nothing, because Adobe provided a similar diagram back before suggesting ColdFusion 11 was going to be out in 2013, and we'd now currently be enjoying ColdFusion 12, a comment they later redacted and denied (see "Rakshith is mistaken about the release schedule for ColdFusion 11"). So they don't mind unashamedly misleading their clients. Anyway, I guess we all knew ColdFusion 12 is in the pipeline: there's already been rumblings about it from people close to Adobe. It's a shame they could not stick to their shorter, more competitive release cycle though. I've not much to add. I'm pretty much posting this so we've got evidence they made this claim, for when they back track and say they didn't make it. (And, yes, I get that products slip: it's not that I mind, it's the lying I can't stand). Have fun @ CFSummit, everybody.